Steve McQueen was an American movie actor who was one of Hollywood's most popular leading men in the 1960s and 1970s. He was nicknamed “The King of Cool” because he often played heroes that were loners like those in The Magnificent Seven or The Great Escape. His real-life affinity for fast cars and motorcycles only added to his persona. Although he never won an Academy Award, he was nominated in 1967 for Best Actor for his role in The Sand Pebbles. He also was nominated for Best Actor four times by the Golden Globe Awards. Steve McQueen's alleged 4th great-grandfather (see Brickwall below) was Thomas McQueen. Thomas McQueen served as a private during the American Revolution. He served in Col. William Crawford's 1782 expedition to destroy American Indian towns along the Muskingum and Sandusky Rivers in Ohio. The goal was to end Indian attacks against American settlers. However the expedition would become more famously known as Crawford's Defeat after the British and their Indian allies learned about Crawford's expedition. The two forces would meet along the Sandusky on June 4, 1782. After two days of indecisive battling and the quick reinforcement of the enemy by British troops from Detroit, Col. Crawford's forces attempted to retreat, but the retreat turned into a rout. About 70 of Crawford's 500 men were killed, and Crawford along with an unknown number of his men were captured. Among these captured men was reportedly Thomas McQueen. After their capture, Col. Crawford and some of his men were executed by the Indians in retaliation for a previous massacre earlier that year by Pennsylvania militiamen against the Indians. Col. Crawford's execution was particularly brutal as he was tortured for a number of hours before being burned at the stake. Although Thomas McQueen survived these executions, he did not go unscathed. The Indians gave Thomas McQueen a beating while Thomas was forced to run the gauntlet. He would later claim that these beatings were responsible for his memory loss and going nearly blind. Thomas McQueen remained a prisoner of the Indians for a year when he was able to finally escape to the British. After about six months in British captivity, he managed to escape again. After making it about 100 miles on his way home, he was retaken prisoner by the Indians and sold to the British. This time he was put in irons and after about three months was offered “his liberty” if he would enlist in the British Army. He refused and remained a prisoner until the end of the war at which time he was able to return home. Thomas McQueen recounted the ordeals he suffered after Crawford's defeat in his application for a pension he filed in 1832. Steve McQueen has a number of royal family connections including Queen Elizabeth II, King Henry VIII, and at least two of King Henry VIII's wives. He also has connections to both Princess Diana and Catherine Middleton, Duchess of Cambridge. Some of Steve's closest famous family relationships includes a number of American patriots that helped build the United States. They include Presidents George Washington and James Madison, signer of the Declaration of Independence Thomas Nelson, and explorer Meriwether Lewis. Steve McQueen also has a number of more distant relationships to other American presidents, signers of the Declaration, and many other famous people. Steve McQueen's 2nd great-grandparents were Joseph McQueen and Catherine Cook. 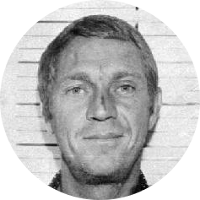 It is at this point that I hit a brickwall with the male line ancestry of Steve McQueen. There are a number of online family trees and forums that take this ancestry back a few more generations by stating that Joseph McQueen was the son of Uriah McQueen and Elizabeth Tanner. They also claim that Joseph's middle name is Tanner, the same as his alleged mother's maiden name. Unfortunately nobody has been able to supply me with any evidence that these claims are true. Joseph and Catherine (Cook) McQueen had a son, the Rev. Joseph T. McQueen. The Rev. Joseph T. McQueen had a daughter named Bessie T. McQueen. The middle names are all reportedly Tanner. If true, this would make a compelling circumstantial case that Joseph McQueen is the son of Uriah McQueen. If anyone can provide me with the evidence that Joseph McQueen is Uriah McQueen's son, or that any of the middle names beginning with “T” are actually Tanner, I would greatly appreciate it.